Yesterday evening was a reminder of why I do what I do, as a parent, and as a woodworker. During the day I was stressed at work keeping up with all the phone calls. It’s getting into the busy season so things are really picking up. That’s fairly inconsequential though, it’s not that difficult to do on mental autopilot. What the main source of my stress was, my wife and I have some friends who are a couple that are going through a rough patch, and have been for a while now. Friday nights have been a regular thing with them for a couple of years now, and my daughter has really grown fond of them too. The guy, whom my daughter has affectionately dubbed “Silly Guy” might be on his way out unless he gets his act together, relationship-wise. He’s a fun dude and my daughter loves playing with him, so the idea of having to explain to her why Silly Guy isn’t around anymore just hurts to think about. So when I got home from work yesterday and my daughter greets me at the door saying, “Daddy! Let’s work on my toolbox!”, I knew that was just what the doctor ordered. Daddy-daughter time, combined with distraction from other problems? Sounds great. The other day she told me she wanted a toolbox, just like Handy Manny. It’s a kid’s show, where a guy and his talking tools fix things. 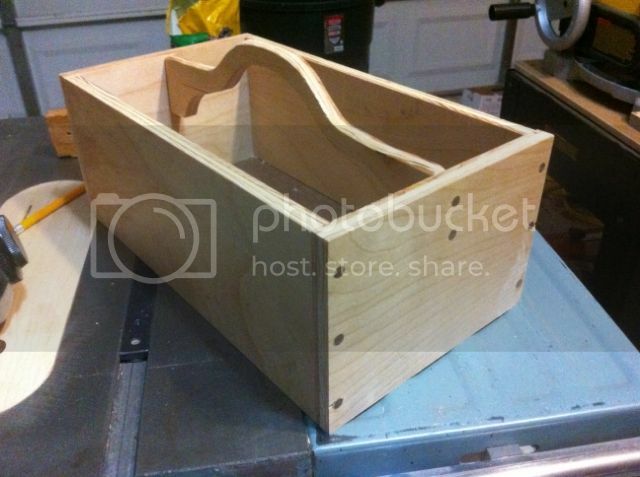 The day before, we’d cut the parts from 1/2” birch ply, drilled holes, and pegged the joints together with walnut dowels. Today we got to saw the pegs and sand them flush. She absolutely loves to saw things. She’s only four, so she’s not quite old enough to do it by herself. But she’ll stand on her stool with her hand on the saw as I guide the cuts. After getting the remaining glue off with a card scraper, I had her stay back while I gave it a good coat of spray lacquer on the back porch. She also told me of her intent to paint it. I guess that’ll be another day. She sure has a strong spirit, I’ll give her that. It’s been hell to deal with during potty training, but her stubbornness can certainly be an assett in the future, I think. I just have to channel it properly. If I had a nickel for every time I’ve heard her say, “Daddy, I can do it myself”, “I don’t need help”, or “Here, let me do it”, I’d have saved enough for a good down payment on her first car by now. And she definitely digs tools. The other day I took her over to my parents’ house to hang out. 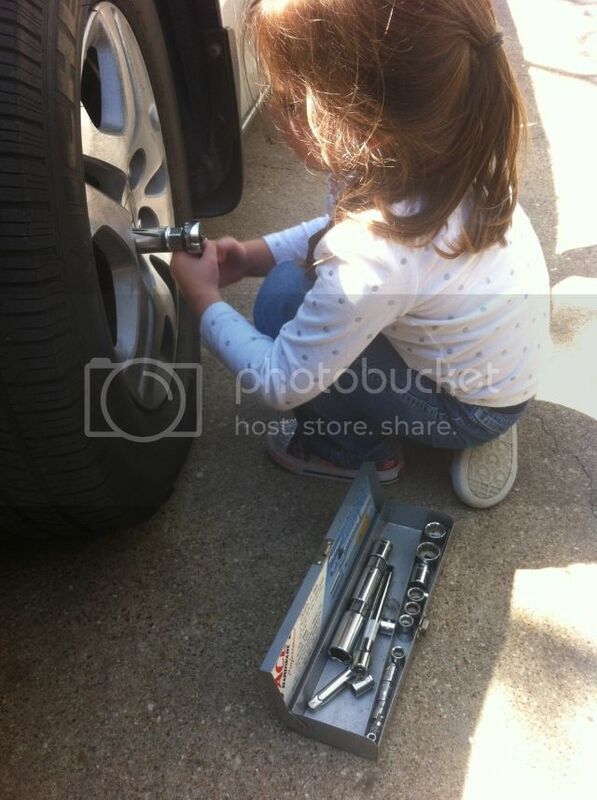 My dad told her, “Show your daddy what you did with the tools the other day.” So my daughter grabs my dad’s ratchet set and goes over to their minivan and starts pretending like she’s changing a tire. She wasn’t actually turning the lug nuts, but she has a firm grasp of what it’s supposed to do. The other day I had to run to the Big Orange Box with her. 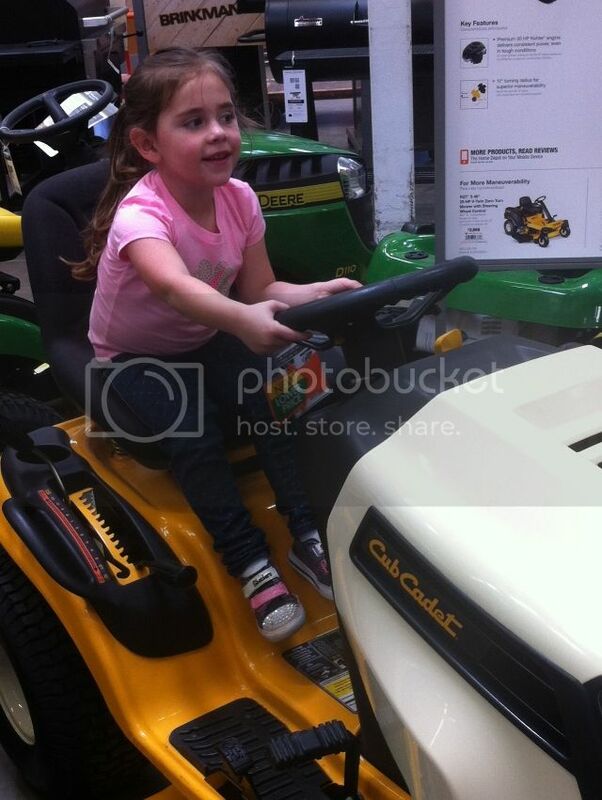 She was enamored with the riding lawn mowers, and insisted that I let her “drive the tractor”. She kept asking me how to start it, having every intent to run the thing herself. Our friend from the aforementioned couple is the mother of two boys, 15 and 12. The younger one in particular is fasincated with machines and building things. When I showed him my woodworking setup in the garage, he begged me to make him a functioning crossbow. Naturally that was met with an emphatic “not only no, but hell no”. Although I said if he wanted me to make him something fun that doesn’t have the potential to easily kill someone, that would be fine. 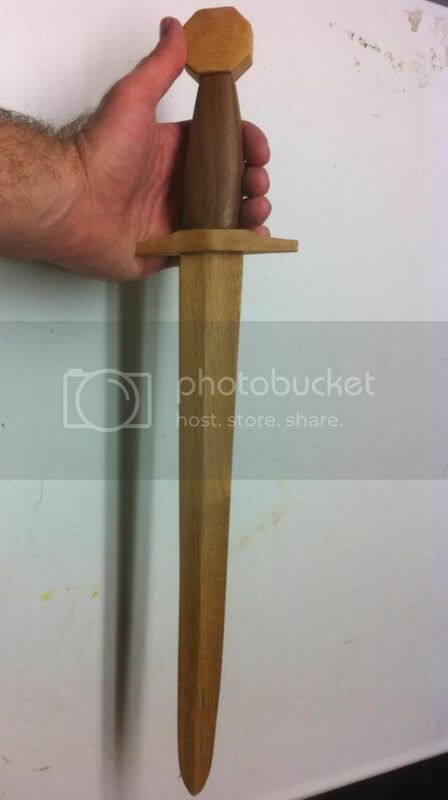 He took a liking to the sword I’d made for myself, and asked if I could make him a dagger. Now that I could do, with blunt edges, of course. So here’s what I came up with him. It’s mahogany with a walnut grip. It was a fun little distraction. Naturally, now my daughter wants one too. She said she wanted a sword, so I’m making her a sword, albeit one for her size. I drew out a few options, like a straight knightly sword or a curved pirate sword. She opted for the straight variety, but added a strange qualifier that I’m still not quite sure how to accomplish. She said, and I quote, “Make me a donut sword.” Uh…ok. After asking a few questions I’m still not sure if it’s supposed to have donuts that fit around the blade, or have donuts painted on the hilt, or what. It’s a mystery. Anyway, that project remains a work in progress, so no pictures yet. Just wanted to share some amusing notes from parenthood. Nothing we’re doing right now will be seen in the pages of Fine Woodworking, but I know that when she grows up that it’s days like yesterday that will be her most fond memories. That’s what counts. Brian, you nailed it, making great memories that will last a life time. Great story. My little girl is just the same! She’s almost 3 and has been enamoured with woodworking ever since she first watched me in my shop while being held in Mommy’s arms. Nowadays she will knock on the door to my garage to be let in, and knows she must have her shoes on before she sets foot in the shop, and her safety glasses on by the time she gets to the work bench :) . She has her own pink Handy Manny inspired tool box, several toys made by me just for her, including a shield from Skyrim and the conductors wand from Little Einstiens (two of her fav’s) & and has a great understanding of the basic function of several hand tools. She likes to take turns working tools as I build, and likes to know she had a part in making her own toys. If anything gets broken in the house, her first comment on the matter is almost always “It’s okay, Daddy will fix it.” – awesome. When I get home from work I’m often greeted with an enthusiatic “Daddy’s home! Please fix this Daddy…” and the presentation of anthor store bought toy that could not stand up to the affections of a toddler. As you stated, the best part is the time we spend together truly connecting and sharing. Being familiar with swords I did consider the Irish style ring pommel for a moment. It might not be what she had in mind, but at least I could call it the donut sword. Granted, mine wouldn’t be nearly this pretty. Great story BTimmons, she will cherish those memories one day like me. The best years of my life, no expectations from the world exept making someone grown up proud by crafting somthing and show them. Maybe we should make a tread abouth plans for childrens toys in the forums, i think i have some old ones lying somewhere if i digg deep :) And i know of some at the local museum il have a look at. Would be great for those With kids in the workshopp. Are you sure Your daughter havent seen a pirate cartoon or something where they had the round half sphere in stead of the normal crosspiece? You seem like a great dad! Koralie, I have no idea where she got the idea from. She does watch a pirate cartoon, but no swords with holes in them there. The only thing I can think of is that she just likes donuts. She also told me that she wants to paint her tool box with flowers, butterflies, and donuts. I’m seeing a theme here. These are moments to cherish. She’ll be asking for the car keys before you know it. Take in every minute you can.